NYC Public Tasting of More Than 30 Natural, Biodynamic, and Organic Wines on June 15th! Will you be in Manhattan on Sunday afternoon, June 15th? If so, then please come and enjoy a taste of summer in your glass! From 4 to 7:30 pm, The Cleveland Restaurant (located at 25 Cleveland Place, between Spring and Kenmare Streets in Nolita) will host a special tasting of natural, biodynamic, and organic wines in its spacious back garden. Spend the afternoon tasting and discovering handcrafted wines made with minimal intervention that express a sense of the place they come from. You will taste more than 30 wines made by winemakers from around the world. There will be wines produced from grapes grown on volcanic slopes, wines made by vignerons who have replaced their tractors with horses, and wines whose grapes were harvested and vinified according to the phases of the moon. Also available for tasting will be digestifs made from hand-foraged fruits. The Cleveland’s chef, Max Sussman, will provide delicious snacks. 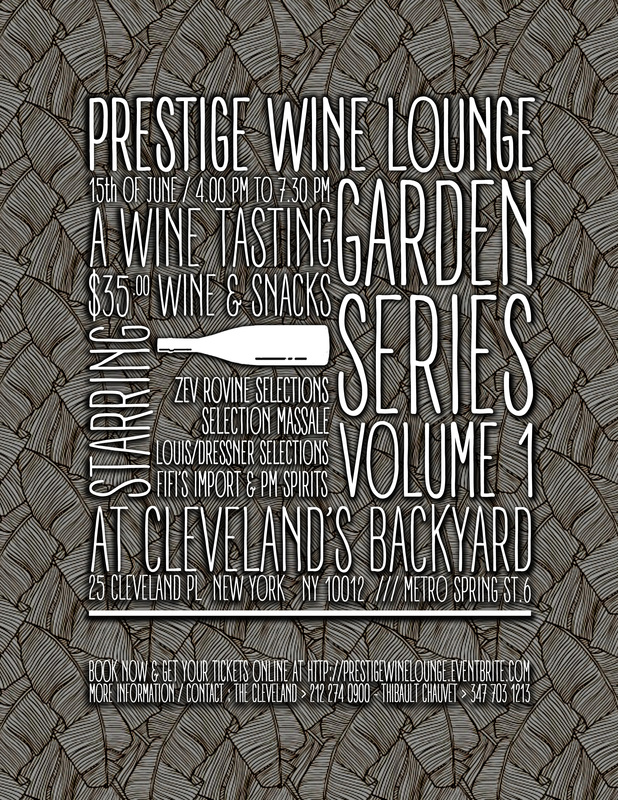 Prestige Wine Lounge–Garden Series, Volume 1, is the first in a series of public wine tastings organized by Thibault Chauvet, of ZRS Wines, to introduce people to these artisanally made natural wines, the men and women who make them, and the importers, retailers, and restaurants that sell them. Thibault wants to build a community in New York of lovers of these wines and this type of winemaking. Five of the leading importers of natural, biodynamic, and organic wines will be on hand: Louis/Dressner Selections, Zev Rovine Selections, Selection Massale, Fifi’s Import, and Nicolas Palazzi from PM Spirits. For more information, contact Thibault Chauvet at 347-703-1213 or thibault@zrswines.com. Taste for yourself, and understand where your wine comes from and how it’s made!